Very vigorous shrub with prickly stems and small divided leaves. Often suckers freely and spreads to form large thickets. Small, fragrant, semi-double to double, soft yellow flowers are freely produced in early summer. Small black hips follow. Best in fertile, moist, well drained soil in an open sunny position but a hardy and robust grower, tolerant of a wide range of conditions. Prune after flowering, cutting back some of the oldest stems to the ground. It may be neccessary to remove suckers to limit spread. From cuttings or separation of rooted suckers. Can be used for informal hedges. Discovered as chance hybrid seedling of Rosa foetida and possibly Rosa spinosissima at the the house of George E. Harison, New York, about 1830. 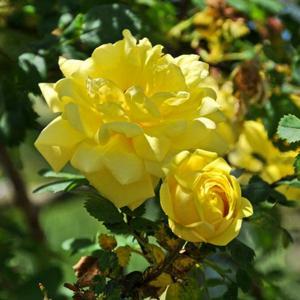 Now naturalised across the USA and thought to be the Yellow Rose of Texas. There is some confusion over the exact name.